Pour cereals into large bowl; set aside. In 1-quart microwave-safe bowl, combine chocolate chips, peanut butter, and margarine. Microwave on High 1 to 1 ½ minutes or until smooth, stirring after 1 minute. Stir in vanilla. Pour chocolate mixture over cereal, stirring until all pieces are evenly coated. 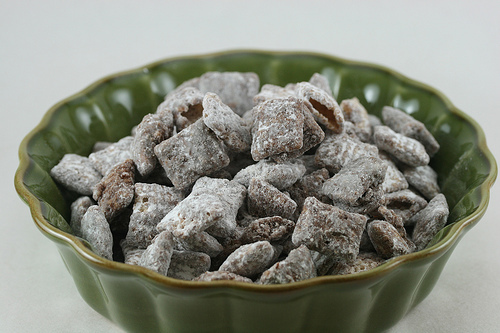 Pour cereal mixture into a large resalable bag with powdered sugar. Seal securely and shake until all pieces are well coated. Spread on waxed paper to cool.